The story of a mysterious mound, and what was inside. After starting in Pittsburgh, the Ohio River heads north and then quickly loops south, as if realizing the error in its ways. It is a place to get lost and to get found. The river bends and twists here with energy, like a snake caught by its tail. There is an optimism in the current, movement and ambition, married with the skeletons of our built world and those worlds that came before that rise out of the fields and hills along the banks. Sometimes in the grace of dawn these structures appear as nearly flesh and blood. But that hope recedes as the sun climbs over the hill, past the chestnuts and maples. Time and gravity wait to do their parts. It’s hard in these settings not to think about the end of cultures, of species, and of ways of life. Maybe it’s the times we live in, with the polar bears trapped on their shrinking ice floes or the Amazon rain forest slowly succumbing to the chainsaw of development. Hard to say. It’s not just animals, of course. Extinction, the end and the uncertainty and mystery that come with it, covers a lot of ground. You know where it leads, but you are never really quite sure where you are on the journey. What’s needed is a guidepost, which is both more and less than a mileage marker, meaningful and maybe a little muddy, like the river itself. That is the best way to approach the Grave Creek Mound, which is in the middle of the city of Moundsville, W. Va. It is in the state’s northern panhandle, with Ohio just across the river. Sometimes called the Mammoth Mound, it is the largest conical burial mound in the United States: 69 feet tall and roughly 900 feet in circumference. Burial mounds are an unusual type of antiquity, beautiful in a way that an engineer can appreciate. By one measurement, Grave Creek contains 55,000 cubic yards of dirt. A standard wheelbarrow holds perhaps a quarter of a cubic yard, so you get the idea that this is a lot of earth that has to first be dug somewhere, then moved somewhere else and not just dumped willy-nilly on the ground but in the right spot at successively higher and more difficult-to-reach places. These mounds dot the Ohio River valley, and they were among the earliest oddities encountered by explorers traveling the river in the late 1700s. A man named Joseph Tomlinson is said to be the first settler to come upon the Grave Creek Mound. In 1770, Tomlinson had moved from Maryland to the area, which at the time was the westernmost reach of the state of Virginia. He chose some promising land a few miles south of Wheeling and built a small cabin. One day, he was out hunting and shot a deer. His dog tracked the animal and Tomlinson skinned the deer. Heading home, he came to a rise. He walked up the wooded knoll and realized he was atop an enormous conical-shaped mound. Although the mound was only a quarter-mile or so from his cabin, it had been hidden there all along. 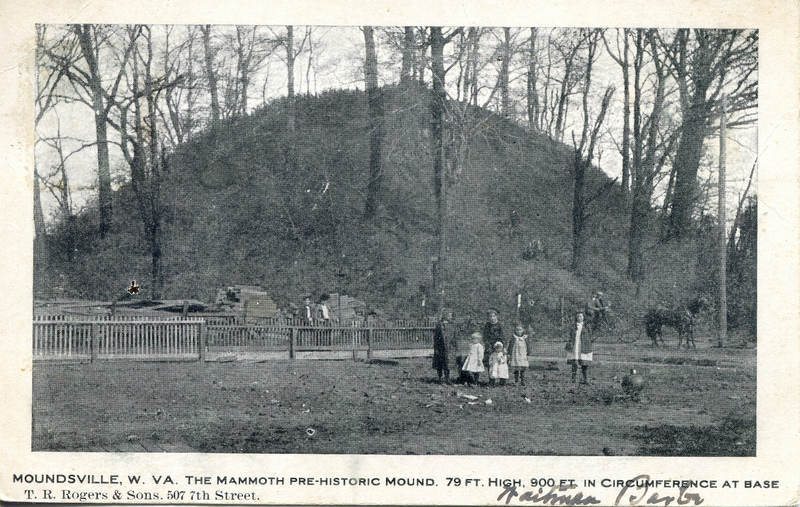 The mound quickly became a popular tourist attraction, boosted in part by its frequent mentions in the river atlases of the day that detailed the sights along the trip from Pittsburgh south. Passengers traveling down the river would make day trips. There was widespread speculation of what was inside. Smaller mounds had already been excavated; Most contained a few skeletons and some trinkets. But because of its size, Grave Creek was imagined to hold something of greater magnitude, perhaps thousands of skeletons, some untold treasures. 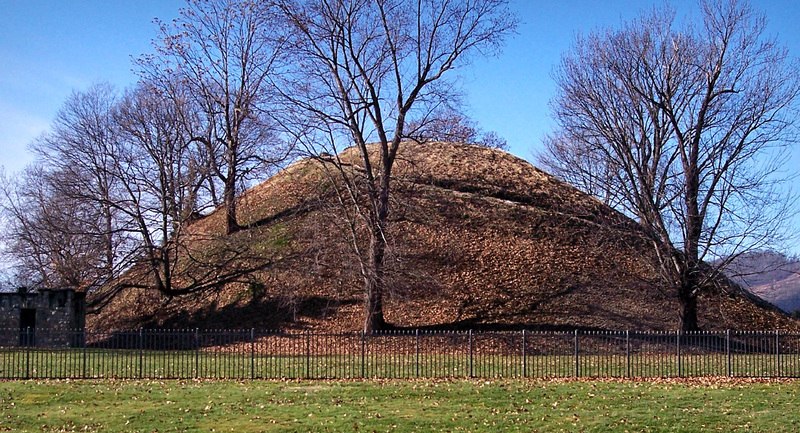 The idea that the mounds in Moundsville and elsewhere were the work of a lost race had been in circulation for years. Scientists of the era attributed them to wandering Chinese, Egyptians, Vikings, and Phoenicians. One theory credited the mounds to a lost tribe of Israel, essentially solving two mysteries with one hill. By March of 1838, the people of Moundsville had raised more than $2,500 to begin the excavation. The Tomlinsons’ plan was to dig a tunnel into the center at about four feet off the ground, then sink a shaft from the top to meet that tunnel, and ultimately charge the curious “a gentle toll” to look inside. But as the tunneling progressed, the diggers discovered that there was actually a smaller mound within the larger mound and that it held a timbered passageway that led to a burial vault. They excavated the vault and found two skeletons, one male and one female. A second tunnel was later dug about halfway up the mound, and a third skeleton was recovered along with some copper bracelets, beads, and a few bits of mica. During the excavation, one additional item was discovered: a small oblong piece of sandstone about the size of a good skipping stone and covered with characters. It became known as the Grave Creek Tablet. The characters were in three rows, separated by straight lines. On the bottom (or was it the top?) was something that looked a little like a sword. A little. Others suggested it looked like a head on a pike, which had its own gruesome charm. From the beginning, there were scientists who doubted the authenticity of the tablet. But many others accepted its provenance and set out to figure out what the characters meant. Schoolcraft considered himself a friend and ally of the Indians, but he also embraced the Grave Creek Tablet as authentic, and he visited Moundsville to learn more. “All other interest becomes subservient to this, since it is the first monument, so far as we know, which appears to bear an alphabetic message from the great unknown void of our aboriginal history, to the present time,” Schoolcraft wrote. Thy orders are laws, thou shinest in thy impetuous elan, and rapid as the chamois. I pray to Christ his most holy mother, son, Holy Ghost Jesus Christ God. United States of Egypt, built by states of Western Union. That sort of satire would seem to settle things, but it didn’t. The tablet’s most ardent supporters cited the lack of a consistent translation not as proof of fraud but rather simply an inability to figure it all out. It wasn’t until 2008 that the true story of the stone’s origin came to light. The forger was James Clemens, a Wheeling doctor who had helped bankroll the mound’s excavation. Disappointed with the results of the digging, he planted the small stone as a way to keep interest alive. The figures were from a book on ancient Spanish coins. 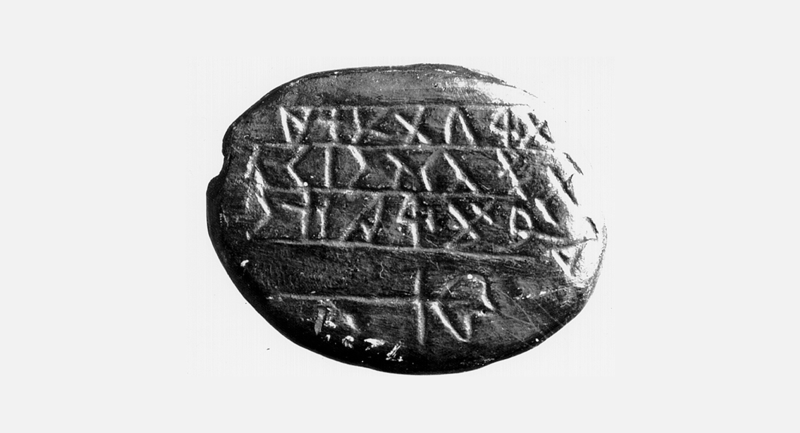 The tablet – although a hoax – did exist. People felt it, rubbed it with their hands. But it has disappeared. All that is left are a photograph and some plaster casts at the Smithsonian Institution. Although Clemens’ fraud created a long-lasting scientific argument, it failed to provide the marketing oomph the site needed. Visitors were few, and those who paid the 25 cents for admission found the mound’s interior cramped and smelly. It closed in 1846. By 1860, a saloon was on the mound’s summit. During the Civil War, artillery troops were stationed there. This part of Virginia separated from the rest of the state and became West Virginia in 1863, and for many years after the war, Union veterans would haul cannons up the mound and fire away. But patriotism only gets you so far. The mound’s savior would come from an unlikely place: the state prison across the street. 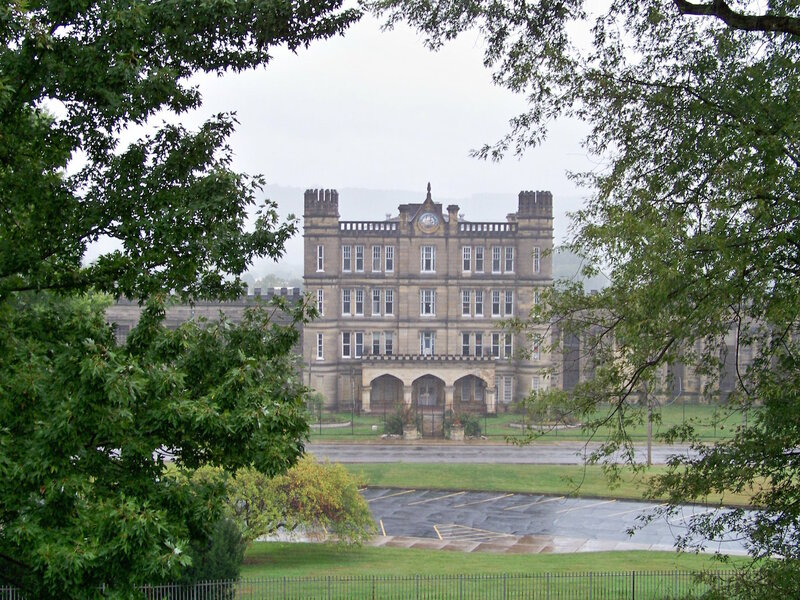 An imposing, gothic structure surrounded by 30-foot walls, the West Virginia State Penitentiary opened in 1866. It bears the West Virginia motto Montani Semper Liberi, “Mountaineers are always free,” which at a prison can either seem like words of inspiration or a cruel joke. In 1874, a former warden, George McFadden, bought the mound and adjacent property for $1,760. His original plan was to build a water tank on it to supply the prison and surrounding businesses. But the plan never was acted upon, and McFadden spent much of the next 30 years trying to find someone to take the mound off his hands. McFadden died in 1906, and his son stepped up the campaign to unload the property. He gave a deadline of June 1, 1908 for a buyer to step forward. The Daughters of the American Revolution took out an option as a stalling tactic, and then the state stepped in and took ownership of the mound in 1909. By this time, the site was in terrible shape. The mound had been neglected, a place for vandals and for assignations. The purchase agreement provided no money for maintenance by the state, but a deal was struck that the inmates would provide free labor for repairs. They filled in the gullies and the dimple on top. They also hauled tons of dirt to the mound, reshaping it in the process into something far more pleasing and regular in appearance. Eventually, the prison went into decline, too. In its early years it had been held up as a model institution, where inmates made their own clothes and published a monthly magazine called Work and Hope. They held boxing matches and put on a minstrel show. But crowding and age took its toll, and conditions deteriorated. A prisoner sued the state in 1981 claiming that a sentence at the facility constituted cruel and unusual punishment. There was a trial and a consent decree and a vow to improve. That didn’t happen. Experts who toured the prison a few years later found it appalling: The sewer system didn’t work. Rats were everywhere. There was little sanitation. One inmate testified he performed the dual role of cook and janitor, wearing the same clothing for both jobs. West Virginia’s Supreme Court attempted to enforce the decree but in the end, the solution was to close the prison. That was in 1995. While a closed prison would seem to be the ultimate white elephant, that isn’t always the case. Today, the West Virginia State Penitentiary is its own tourist attraction, offering visitors a glimpse into life behind bars in an era before prisons became known as correctional facilities. It also serves as a training center, including staging the occasional mock prison riot, in which members of the general public can play the part of unruly inmate. All these enterprises are run out of the Moundsville Economic Development Council. It is a way to bring money and attention to a community that is hurting. 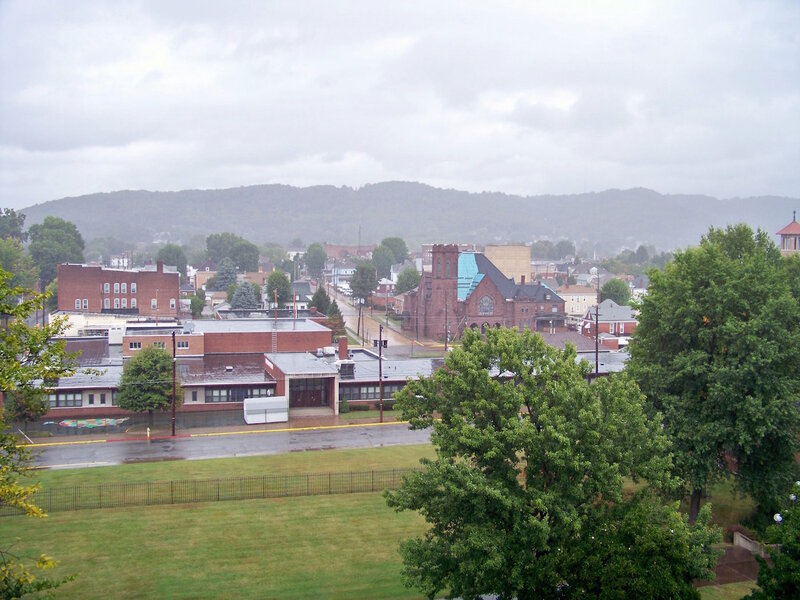 Since 1960, Moundsville has lost 40 percent of its percent of its population, some 6,000 people. Now, there’s nothing wrong with reinvention, but the transition from prison to theme park and training center is remarkable. One institution died, and another took its place, unburdened by the sins of the past. It shows how quickly the past can be put in the past. That is perhaps what is most authentic and American about the prison; its refusal to get mired in the problems of yesterday. Grave Creek is almost the opposite. It is largely unchanged from how it was before all the digging began. The tunnels have been filled, and it remains an oddity, quirky and little else. Part of the mound’s problem is that there are still unanswered questions. The theories of lost races have been discarded, along with the tablet hoax. There is a gap in the historical record. Because we don’t know the first story, we’re unable to create a new story. It’s like that old saw about every lie beginning with a small truth, a magpie’s nest where fact and fiction are woven together. We don’t know the truth about Grave Creek’s past, and our efforts to cobble together a story — real or invented — can only take us so far. We are left with our imagination. But we are also left with something more important, which is a reminder that we don’t know everything and that sometimes it is simply better to ask questions than to get answers. Of course I wonder about the mound builders and why they disappeared. But there’s something more basic, more primal, than the historical record and archaeology. Staring at the big hill before me, the river to my back, what I really want to know is how they knew when the mound was finished and there was no more dirt to move. Ken Otterbourg is a writer living in Winston-Salem, N.C. His articles have appeared in Fortune, The Washington Post Magazine, National Geographic and other publications. You can follow him on Twitter at @otterbourg and read his stories at kenotterbourg.com.